This data set includes weekly (January 1954 to December 2013) and monthly (January 1850 to December 2017) midpoint historical sea ice concentration (0 - 100%) estimates at 1/4 x 1/4 degree spatial resolution for the ocean region around the state of Alaska, USA. This value-added dataset was developed by compiling the below historical data sources into spatially and temporally standardized datasets. Gaps in temporal or spatial resolutions were filled in with spatial and temporal analog month approaches. Note the monthly values from January 1954 - December 2013 are the week 2 values from the weekly time series. They are provided in the monthly time series for ease of use in monthly midpoint analyses. The January 2014 - February 2017 monthly time series data have been regridded and processed to match the January 1954 - December 2013 series from the NSIDC 0051 Sea Ice Concentrations from Nimbus-7 SMMR and DMSP SSM/I-SSMIS Passive Microwave Data, Version 1, which were accessed from the NSIDC website (http://nsidc.org/data/docs/daac/nsidc0051_gsfc_seaice.gd.html). The further post-processing and regridding of the NSIDC product to the extent / crs / origin / resolution of the existing data, was a non-standard process. It involved initially warping the polar stereographic data to a pacific centered WGS84 crs, converting the sea ice concentration values to points and performing a spline interpolation across the entire domain. This interpolated raster was then filled further around the land-sea divide where there was a mismatch between the NSIDC mask and the Sea Ice Atlas mask. The filling was performed by taking the average of the surrounding sea ice concentration pixels and filling the missing locations. These locations have been flagged in the source band (band 2) to keep track of what was modified from the NSIDC 0051 for this purpose. These data are a compilation of data from many sources integrated into a single gridded product. The sources of data for each grid cell have changed over the years from infrequent land/sea observations, to observationally derived charts, to satellite data for the most recent decades. Temporal and spatial gaps within observed data are filled with analog month approaches. Please note that large portions of the pre-1953, and almost all of the pre-1900 data, are either analog or interpolated data and the user is cautioned to use these data with care. Methods of data compilation varied by data source, but included visual interpretation of hard copy map notation and legends, scanning, digitization, geo-rectification into digital geospatial products, reprojection, and also resampling into a common resolution. To standardize the data onto a common spatial grid, the resampling methodology utilized the centroid of the target 1/4 x 1/4 grid cell as the location to extract the value from the underlying data source. The dates for the weekly dataset correspond to weekly midpoints (1, 8, 15 and 23 of each month) with 4 weeks in each month. For example, for the month of May, our data would be a best estimate for the week including May 1, May 8, May 15 or May 23. The estimates should be considered ‘centered' on the dates, however. So, for May 15, the data could have come from May 12 - May 18. Data source attribute values (coded as numbers) below correspond to the described source. We have indicated if the source applies to the weekly, monthly, or to both time series. Danish Meteorological Institute (DMI) 1893-1956: These charts provide observed and inferred sea ice extent for each summer month (May to September). Additionally, Kelly et al. have digitized summer ice edge information from DMI's monthly maps (see #4). Naval Oceanographic Office (NAVOCEANO) 1953-1971:Oversees the Naval Ice Center (NAVICE), which provides worldwide operational ice analyses for the US military and government agencies as well as allied nations. Sea ice maps for Alaska and Greenland sectors were compiled into yearbooks for the period 1953–1971. Hard copies of yearbooks are held by the National Snow and Ice Data Center (NSIDC). In 1972, ice charting was transitioned to the predecessor of the National Ice Center (see #6). National Snow and Ice Data Center (NSIDC) SMMR/SSMI/AMSR 1978-2014: Three separate microwave sensors. AMSR-E is the latest sensor, improving upon past microwave radiometers SSM/I and SMMR. The spatial resolution of AMSR-E data doubles that of Scanning Multichannel Microwave Radiometer (SMMR) and Special Sensor Microwave/Imager (SSM/I) data. Also, AMSR-E combines into one sensor all the channels that SMMR and SSM/I had individually. Arctic Climate System Study (ACSYS) 1850-1986: An activity of the World Climate Research Program. Includes digitized ice edge positions for the north Atlantic. ACSYS Ice edge information is irregular in time and space, and is most frequent in the 20th century. When available, ice edge data are provided monthly. The ACSYS study has expanded into the Climate and Cryosphere Project. Visit the ACSYS/CliC Historical Ice Chart Archive to access all data from this work. NSIDC Bill Dehn Data Collection 1953-1986: Scanned versions of almost 7,000 ice charts donated to the National Snow and Ice Data Center (NSIDC) by the estate of Bill Dehn are available through a searchable interface. 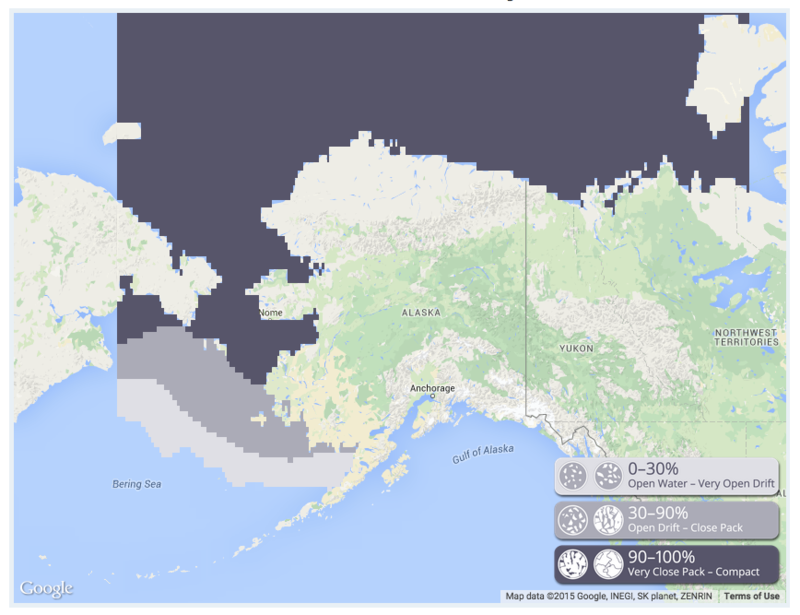 A subset of the charts has been digitized by the Alaska Center for Climate Assessment and Policy (ACCAP). Danish Meteorological Institute (DMI) 1953-1990: previous implementation of these data, but over a different timespan (1953-1990) than source above. Whaling ship log books: open water 1850-1914 Whaling ship log books 1850-1914: extracted and digitized daily data on the presence or absence of sea ice from logbook records of annual cruises in an unbroken record from 1850 to 1914, though there were very few cruises (hence inadequate data) from 1911 to 1914. The data include more than 52,000 daily observations in an unbroken 65 year record from 516 cruises. These represent 19% of the total 2,712 cruises. Whaling ship log books: partial sea ice 1850-1914 Whaling ship log books 1850-1914: extracted and digitized daily data on the presence or absence of sea ice from logbook records of annual cruises in an unbroken record from 1850 to 1914, though there were very few cruises (hence inadequate data) from 1911 to 1914. The data include more than 52,000 daily observations in an unbroken 65 year record from 516 cruises. These represent 19% of the total 2,712 cruises. Whaling ship log books: sea ice covered 1850-1914 Whaling ship log books 1850-1914: extracted and digitized daily data on the presence or absence of sea ice from logbook records of annual cruises in an unbroken record from 1850 to 1914, though there were very few cruises (hence inadequate data) from 1911 to 1914. The data include more than 52,000 daily observations in an unbroken 65 year record from 516 cruises. These represent 19% of the total 2,712 cruises. values for pixels inland that are covered by ice in the pre-2013 monthly data, but do not have data in 2014-2015.
values filled recursively with its surrounding neighbors average. Errant sea ice exists in some months from the NSIDC, we have removed these by looking back through the record to see if sea ice existed in that location for all other years in that month, and if it did not, the pixels were set to zero.